I grew up in Wichita, Kansas, in the 1980s, a golden age for fast food before society demanded restaurants at least pretend to be interested in their customers’ health. The food? Greasy, cheap, and guilt-free. Wichita, the birthplace of not one, but two fast food behemoths—Pizza Hut and White Castle—was the epicenter of it all. The town was lunchtime Valhalla for the OxyPad set, and it’s not just hearsay: A 2011 Business Insider story puts Wichita at number three, behind Plano, Texas, and Madison, Wisconsin, in terms of fast food consumption. At my high school, we got 50 minutes for lunch, which was more than enough time to cram five or six hungry boys into the bed of Jason Ahles’ Chevy pickup and hit one of the hundreds of fast food options available within a two-mile perimeter. Our options included the holy trinity, of course—McDonald’s, Taco Bell, and Kentucky Fried Chicken—but also every second-tier establishment, like Arby’s or Long John Silver’s; beloved local chains Taco Tico, Knolla’s, and Spangles; and if all else failed, Hardee’s, which we despised for some reason. On adventurous days, we sped across Wichita’s wide boulevards to Grandy’s, a home-style joint that employed a bespectacled old lady in an aproned dress for the sole purpose of handing out lollipops and tsk-tsking kids for not finishing their country-fried steak and biscuits. We always finished. No one dared incur the disapproval of Grandy. Also: free lollipops. But when we were really feeling classy, we hit Pizza Hut. It was the one place I knew where kids got shown to a table-clothed table like adults and waited on by a person who brought you silverware. We each ordered a Personal Pan Pizza, and if it didn’t arrive within five minutes, it was free. That was upscale. In 1958, when Frank and Dan Carney launched the empire in a 600-square-foot former bar on Wichita’s east side, they couldn’t possibly have known that by the late ’80s it would become a sophomore’s idea of destination dining. For me, every pie had to have something like Pizza Hut’s gooey, blistered cheese, overseasoned tomato sauce, and uniformly sliced (and waterlogged) toppings. But most of all, that crust. Spongy, skeezy, and made with obviously frozen dough, it was so oily that it made your fingers shiny. 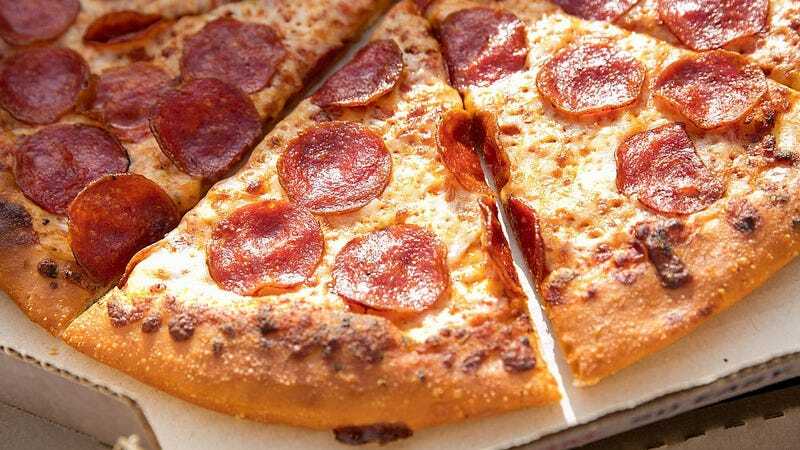 Every time I dreamt about Pizza Hut, the idea etched further into my developing brain: This is pizza. When I left for college, every other pizza—no matter how good—felt wrong. Deep-dish had too much cheese, and the sauce tasted like tomato candy. New York slices had the grease in all the wrong places. Fancy-pants pies from wood-burning ovens felt soupy and fussy, the kind of thing we would have hurled from Jason’s Chevy. During grad school in Lawrence, Kansas, I delivered for Pyramid Pizza and ate almost as much as I transported, but I never developed the same taste for it. It was too late. My tastebuds were stuck in 1988. It wasn’t until I moved to Chicago that I recognized the inherent elitism of the Pizza Cognition Theory. The implication suddenly seemed to be that if you were lucky enough to grow up somewhere near Naples or New York you’d be okay. But if you spent your formative years in some mid-sized fast food backwater where the main pastime was jumping speed bumps, you were out of luck. Chicago obviously has its own pizza issues. The city’s draconian opinions about what is and isn’t “real” pizza—we can’t even agree on how to slice the pies—go on and on with no new insights and no end in sight. No one here is interested in my precious pizza learning curve. Enter the debate with any doubts and you’re irrelevant. “Learned behaviors and tastes can be unlearned,” Sifton wrote, negating pretty much everything about the Pizza Cognition Theory. “Thus are colts broken and prisoners released from jail.” While this feels vaguely condescending, too—wait, I was in jail?—it also rings true, sort of. I grew up to be a food writer, and co-wrote an entire book about pizza. I’ve eaten enough pizza over the years to pretend I have reprogrammed my mind and my tongue to appreciate other styles beyond my childhood crush. But the reprogramming will never be complete, nor do I want it to be. After 20 years as a dining critic, I’ve grown comfortable toggling between highbrow and lowbrow. I’m lucky enough to eat ginger-inflected A5 wagyu beef served on a section of halved cow femur at a four-star restaurant; then I crave Taco Bell. What’s wrong with that? Pizza Hut still tastes good to me. I often eat it at Target, where the crust and sauce have been debased to the point of fulfilling my children’s insatiable breadstick lust. We live on the south side of Chicago, surrounded by “real” pizza. But they always ask for those breadsticks, sealing their own fate with each bite. And on the rare occasion that their breadsticks go unfinished, no force on Earth could stop me from eating them. My heart may be in Chicago, but my stomach forever remains in Wichita.